• Action Plan sets out next steps to promote better integration amongst communities. • Measures include creating opportunities for people to mix with those from other backgrounds, boosting English language skills, and supporting migrants to develop a good understanding of life in England. • This builds upon the proposals set out in the government’s Integrated Communities Strategy green paper. Better integrated communities and a stronger society based on the common themes that bind people and places together are the driving force in the Integrated Communities Action Plan, published today (9 February 2019). Communities Secretary, Rt Hon James Brokenshire MP, has today outlined the government’s next steps to deliver the vision of the Integrated Communities Strategy green paper. • Improving the opportunities for those wishing to learn English by developing a new national strategy for English language. 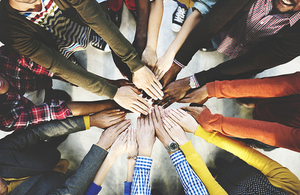 • Helping new migrants integrate into their communities, by trialling a package of practical information to help them meet, mix and build social connections with neighbours and the wider community. • Publishing a new Community Guide to Action ensuring that communities across the country, whatever their local interest, have access to the information and advice to enable them to improve their local area. This could include taking much loved local assets into community ownership. • Working in partnership with 5 Integration Areas to develop bespoke local integration strategies, trying new bold and innovative approaches including helping more marginalised women into work. • Collaborating with civil society to support refugees to rebuild their lives and integrate in the UK, by taking forward actions that focus on English language, employment, mental health and information for refugees. • Reaffirming our support for faith communities and empowering faith leaders with the confidence and knowledge to meet the changing needs of their congregations. This would include helping them to identify issues like mental health concerns, as well educating them on UK marriage law. "We are a successful, diverse democracy – open, tolerant and welcoming. These characteristics are as British as queuing and talking about the weather. "However, we cannot ignore the fact that too many places across the country have divides, the benefits and opportunities our great country offers are not always felt by everyone equally. "Our new action plan charts a course for how we will engage and work with communities to bring people together in recognition that there is more that binds than divides us. "And as we embark on a new future outside the European Union, we need to ensure that everyone, whatever their background, has access to the same opportunities." This Action Plan is for England. Government departments aim to deliver the commitments in this Action Plan by the end of this Parliament. The Integrated Communities Strategy green paper was published on 14 March 2018. Over 3,400 responses from individuals and organisations were received to the consultation. These organisations spanned a wide range of sectors including, faith, education, local authority, social and academic. It also includes the House of Lords Select Committee on Citizenship and Civic Engagement, whose report of their recent inquiry formed their response to the consultation. The government response to the Integrated Communities Strategy green paper was published today (9 February 2019). Each of the 5 Integration Areas has set up a Local Integration Partnership to bring local partners together, including businesses and the social and faith sectors. Through engagement and consultation with local people, each Local Integration Partnership has identified its local priorities and the most effective ways to address them. Blackburn with Darwen launched its strategy, Our Community Our Future, on 6 December 2018 and Walsall launched its strategy, Walsall for All on 31 January 2019. The remaining local strategies will be launched in the coming months.